For group bookings of 8 guests or more, property will charge 50% Non Refundable Deposit on the day of booking or anytime after. The remaining 50% is due 14 prior arrival. Should the group fail to pay the deposit or the remaining 50% 14 days prior arrival, the reservation could be cancelled and the beds released. For bookings arriving in less than 14 days, the full amount is due the day of booking. Same day and next day group arrivals should confirm availability on the phone with the property prior reservation. Same day and next day group arrivals should confirm availability on the phone or by email with the property prior reservation. 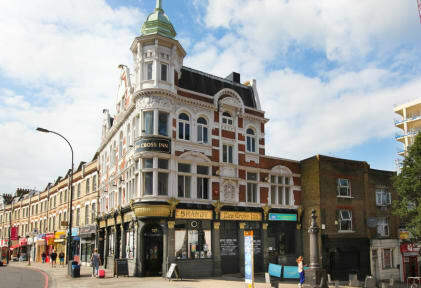 The New Cross Inn is an affordable hostel situated in South East London. The hostel is 2 minutes walk from New Cross Gate and New Cross underground and overland train stations. A train to or from London Bridge Train Station takes only 6 minutes and you can comfortably use your travelcard without the need to pay any extra fee. We are very convenient if you're coming to London to attend a concert or event at the O2 Millenium Dome. The Hostel is only a 15min bus ride to the 02 Arena. The Hostel has a variety of twin rooms and small dormitories, some of which have en-suite bathrooms. All rooms have been refurbished and have basins and most have fridges for the guests. The hostel has a guest common room with digital TV, movies, board games and a mini library. We have 2 guest kitchens and every floor has several bathrooms boasting both showers and baths. Throughout the hostel is free WiFi internet access and we have an internet terminal by reception. We also offer a laundry facility and lockers for guests, and free earplugs are available for light sleepers. Reception is open 24 hrs and our friendly staff will be happy to help you with directions and advice. All this and still our prices are super low and include a complimentary continental breakfast. The Bar underneath the hostel also offers discounts and free shots for our guests and often has live music / DJs. The bar has a pool table and shows all the major sports events live. Please let us know if you need a quiet room. **** We do not accept customers under 18 years old and over 40 years old unless they are part of a group staying in a private room. We reserve the right to refuse your accommodation at any stage according to the manager discretion. We require 72 hours notice for a cancellation, if you do not give us 72 hours notice you will be charged in full. Groups of 8 guests or more will be charged 50% deposit on the day of booking. The remaining 50% is due 14 prior arrival. **** Non-refundable reservations will be charged anytime after booking.